Be the first to share your favorite memory, photo or story of Jacob. This memorial page is dedicated for family, friends and future generations to celebrate the life of their loved one. Preceded in death by Jude and Frances. Survived by fiancé, McKenna O’Keefe; parents, Dave and Trish Folda; siblings, Matthew, Joseph, Abigail, Anne Catherine, Benedict and Anthony; grandparents, Dave and Maureen Folda and Stephen and Lois Mahowald; his extended family and good friends. Commonly seen in camouflage, Jacob Folda was an avid outdoorsman and hunter, and his love for the outdoors was contagious. His best days were spent in nature, hunting and fishing, and from his boots to his pickup truck, he loved everything country. His grandpa, siblings, uncles, cousins, and friends were his companions and hunting with them was truly his passion. Born in 1995, the oldest of seven siblings, Jake was all boy. Growing up, he loved super heroes and comic books, and was even known to draw his own. 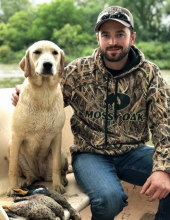 Jake played baseball until the age of 15, when his love of the outdoors took priority. He played softball on the Millard Electric team when he worked there after high school. As a young boy, Jake would build duck blinds in the front yard of the family home and attempt to call in waterfowl with his duck calls. The neighbors weren’t fans of his efforts, but Jake became quite skilled at the art of calling. He also loved to fish and even did so in tournaments. Jake got his first Mallard at age eleven, and was recognized as a Master Angler by the game and Parks Commission at the age of fifteen. He graduated from Millard West High School in 2013, after which he pursued a career as an electrician. Jake completed his apprentice work in April 2017, and became a Licensed Journeyman and a Union Member of the Local 22 IBEW. Jake attended Mass at St Patrick’s Parish and then Immaculate Conception Catholic Church, where he served as an altar boy for many years. He believed in the protection of Our Lady of Mt Carmel and the promises of the brown scapular and it was found on his person at the time of his death. Jake loved his family, Mom (Trish), Dad (Dave), and younger siblings Matthew (21), Joseph (18), Abigail (16), Anne Catherine (14), Benedict (11), and Anthony (8). He loved family get-togethers, spending time with his buddies and his beautiful bride-to-be. Jake was much loved and will be missed immensely by his fiancée, family and friends and his beloved lab. May he find eternal rest under the mantle of Our Lady of Mt. Carmel and in the arms of our beloved Savior, Jesus Christ. The family of Jake Folda wish to thank you all for your kind thoughts and most of all for your prayers for Jake, McKenna, their family and friends. Arrangements entrusted to John A. Gentleman Mortuaries. The family requests Mass offerings in lieu of flowers. "Email Address" would like to share the life celebration of Jacob Stephen Folda. Click on the "link" to go to share a favorite memory or leave a condolence message for the family.